For the “wow” factor of a large immersive display environment to entertain large numbers of viewers at a show (or other such venue) the Immersive 8m domes are available from start of 2010. We offer inflatable igloo style environments that can be easily transported and erected within 90 minutes to cater for up to 45 people inside! Outdoor dome is 5.2 metres high, so is a large feature in any show. Can be used indoors to provide a fixed planetarium site. Please contact us soon if you require this for your large fete, show or organised public event. Call 01202 304734 to use these unique domes. WE NOW HAVE TWO OUTSIDE DOMES OF DIFFERENT SIZES. Please be aware that the cost reflects a two-man operation. 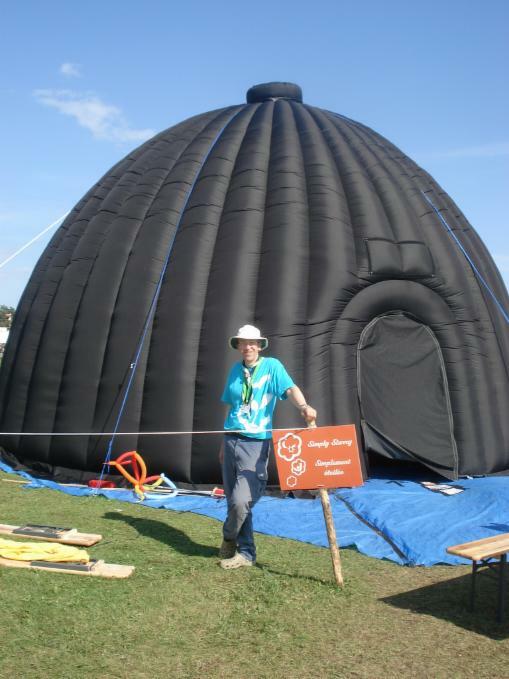 The cost for a smaller 25 person size dome (30 with children) is £750 per day, plus VAT and travel costs. Both domes come with limited soft benches (seating 10 to 15), with cushions for the remaining space. All domes require a space 10.5m long x 10.5m wide x 5.2m high. Ready access to a standard 13amp power socket is also required OR outside standard 3 round pin sockets in a covered terminal block. We do not supply a generator due to inadeqaute supply to PC's. IF COST IS A PROBLEM AND YOU ARE A SCHOOL FAIR ORGANISER--For schools fairs we may be able to earn an income for the school by a modest audience charge, with our spilt fees facility. No charge (as above) for booking but we charge the public on entrance and spilt the fees. Only available for schools to support in South of England- Hants and Dorset, travel and hire costs apply to rest of UK. ALL DOMES ARE SUBJECT TO RISK ASSESSMENTS- they deployed are under strict safety rules are subject to wind and weather tolerances of any structure of a TDS (Temporary Demountable Structure)- tent or inflatable. See link for our Risk assessment and HSE Gov.